Deputy Minister Nalin Bandara at the exhibition. IDB Chairman Naveen Adhikarama is also present. The first phase of the Bingiriya Export Processing Zone in the Kurunegala district will commence on February 28, under the patronage of Prime Minister Ranil Wickremesinghe, Deputy Development Strategies and International Trade Minister Nalin Bandara said. The Premier is very keen to see export processing zones set up across the country, the Deputy Minister said. The exhibition and trade fair was held in collaboration with the Centre for Development of Leather Products and Footwear, and under the aegis of the Industrial Development Board (IDB), with the support of the Export Development Board (EDB). 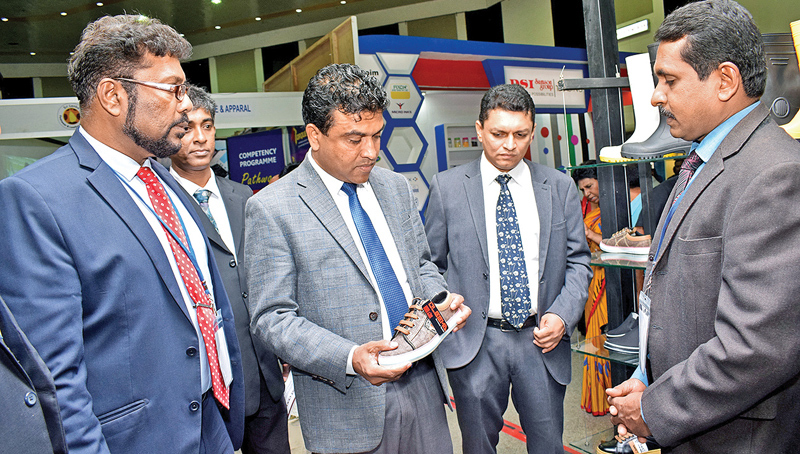 Deputy Minister Bandara said that the footwear and leather products industry has great potential to be one of the leading industries earning much-needed foreign exchange for the country and the government will provide industrialists all assistance necessary to realise the full potential of the industry. Newly appointed IDB Chairman Naveen Adhikarama said it was significant that the Association has the strength and capacity to hold such a big exhibition and fair for the eleventh year. He said the fair had the participation of about 470 industrialists on behalf of 20,000 families. The industry provides employment to 300,000 families with a GDP contribution of Rs. 400 million in Sri Lanka and has the potential to be participants of the Rs. 200 billion dollar industry by 2020. “We are here to achieve that goal. We train those are already in the industry as well as the new entrants to the industry and by now we have conducted about 600 workshops across the country,” Adhikarama said. The fair which is now an annual event, has contributed immensely to creating awareness of the Sri Lanka footwear and leather industry locally and internationally. Sri Lanka Footwear and Leather Product Manufacturers’ Association President P.G.D. Nimalasiri requested the Minister to look into the possibility of low cost financial facilities for the industry. On behalf of the Association, he also requested the Deputy Minister not to allow foreign companies to set up footwear factories in the country with the sole purpose of catering their products to the local market which is already saturated. He however said they have no objections to foreign investors setting up factories for exports. The Association had the support of the Industry and Commerce, Resettlement of Protracted Displaced Persons and Cooperative Development Ministry, along with the Export Development Board (EDB), which pioneered the exhibition in the 2007.